In 1999, there was only one through train per day each way between Hull and London King's Cross, GNER's Hull Executive. In May 1999, former British Rail managers Mike Jones and John Nelson through their Renaissance Trains business, lodged an application to operate an open access service. A joint venture was formed with GB Railways taking an 80% shareholding and Jones and Nelson each holding 10%. In December 1999, a four-year track access agreement was granted by the Office of Rail Regulation with operations commencing on 25 September 2000. In September 2002, the access agreement was extended for ten years. In August 2014, FirstGroup purchased the remaining 20% shareholding In 2015, it resumed trading as Hull Trains. In March 2016, First Hull Trains obtained approval for a further 10 year open access agreement until 2029, allowing them to proceed with ordering five Class 802 electro-diesel multiple-units which had been announced by the operator on 3 September 2015. Hull Trains operates up to six daily return services between Hull and London King's Cross on weekdays and a daily service between Beverley and Kings Cross. On weekends there are five daily services between Hull and Kings Cross only. In 2008, First Hull Trains applied for track access rights to run services between Harrogate and London King's Cross via York under the First Harrogate Trains banner and from Cleethorpes to King's Cross to via Lincoln and Spalding. In January 2009, the Office of Rail Regulation released its decisions on the ECML route planning and rejected First Harrogate Trains' application. Hull Trains began operations with 3-car Class 170 Turbostars hired from sister GB Railways company Anglia Railways. There was at least one occasion of an Anglia Railways Class 86 and Mark 2 set operating as far as Doncaster. When the Strategic Rail Authority changed its policy on allowing train operating company assets to be hired out, Hull Trains needed to acquire its own fleet. 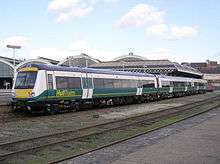 It ordered four 3-car Class 170 Turbostars, the first entering service in March 2004. These were intended only as an interim solution as four 4-car Class 222 Pioneers were ordered at the same time, but because the former were part of a speculative order already placed by Porterbrook they would be available in time. The Class 170 Turbostars entered service in March 2004. It was planned that after being replaced, they would then be used on new services, but these services were never introduced, so the Class 170 trains were transferred to First ScotRail. The Class 222 Pioneers entered service from May 2005. In January 2007, a Class 222 Pioneer was damaged when it was dropped off a maintenance jack; it would ultimately take two years to repair. After making do with only three trains, in January 2008 a Class 86 was hired from the AC Locomotive Group to haul a set of Mark 3s hired from Cargo-D for weekend London King's Cross to Doncaster services. In April 2008, two Class 180 Adelantes were leased to replace the locomotive-hauled set and allow a maintenance backlog that accrued on the Class 222 Pioneers to be cleared. Later in 2008 another two were leased to release the Class 222 Pioneers for transfer to East Midlands Trains in 2009. 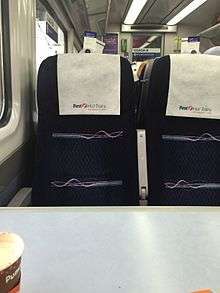 In the Class 180s, Coach A is the quiet coach where mobile phones and personal music devices are not allowed, Coach B is standard class including the buffet/shop, Coach C is standard seating, Coach D is first class, and Coach E contains airline-style seating and wheelchair accommodation. In September 2015, Hull Trains announced an order for five new 5-car bi-mode high-speed trains from Hitachi, with seating for 320 people and a maximum speed of 140mph. In its proposed track access application, Hull Trains confirmed that these would be Class 802s. Class 222 Pioneer diesel multiple unit 2005 4 2009 Replaced by Class 180 Adelante. Class 222s transferred to East Midlands Trains, locomotive hauled stock stored. Maintenance of the Class 180 Adelantes is undertaken at Old Oak Common Depot alongside Great Western Railway's fleet. Two sets (or occasionally three if there are no sets on maintenance) are stabled and serviced each night in Hull sidings by Hull Trains staff (where there are usually two fitters on at night to undertake basic fault repair and diagnostics) with fuelling and emptying of toilet tanks being undertaken at Northern's Botanic Gardens Depot. The third service set is stabled at either Bounds Green or Old Oak Common as service requirements dictate. A day fitter is based at Hull. Previously much of this work was undertaken by Bombardier at Crofton and only one set left in Hull each night. ↑ The Pioneer Issue seven. First Hull Trains Magazine Spring 2008. ↑ "First Hull Trains track access extended until 2029". European Railway Review. 23 March 2016. Retrieved 6 April 2016. ↑ "New Trains for Hull Trains As Company Announces Million Investment" (Press release). Hull Trains. 20 September 2002. Archived from the original on 24 January 2003. ↑ "Hull rail firm to buy 140mph trains". BBC News. 3 September 2015. Retrieved 8 September 2015. ↑ "3.2". Proposed Track Access Contract Between Network Rail Infrastructure Limited and Hull Trains Company Limited under Section 17 of the Railways Act 1993 (PDF) (Report). Office of Rail and Road. 7 October 2015. p. 8. Retrieved 7 January 2016.